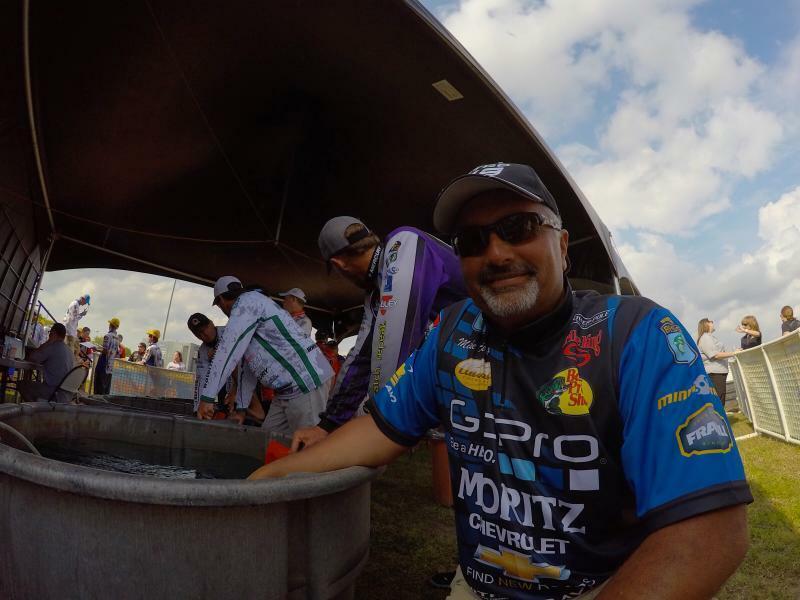 Good Luck to Moritz Chevrolet Pro Mike Kernan in the first Bassmaster Elite Series tournament of the year. I spoke with Tubbs yesterday he said Mike was feeling pretty confident in the areas he found in practice. Hopefully the fog delay won't cut into too much of his time. Go Kernan we are pulling for you!!! I'm pretty sure I picked Mike in my fantasy fishing. I just had a feeling. So I'll be rooting for him! Last edited by Bissett; 03/19/15 02:31 PM. I was at the ramp this morning and the fog was very thick. Good luck to Mr Kernan in his first Elite event! Just finding those 14" bass is the key...river is very muddy with lots of trash and logs rolling through due to rains. according to the live blog he just boated a 6lber. That's a great photo of that 6lber! Way to go Mike!!! His mug is on the front page right now. 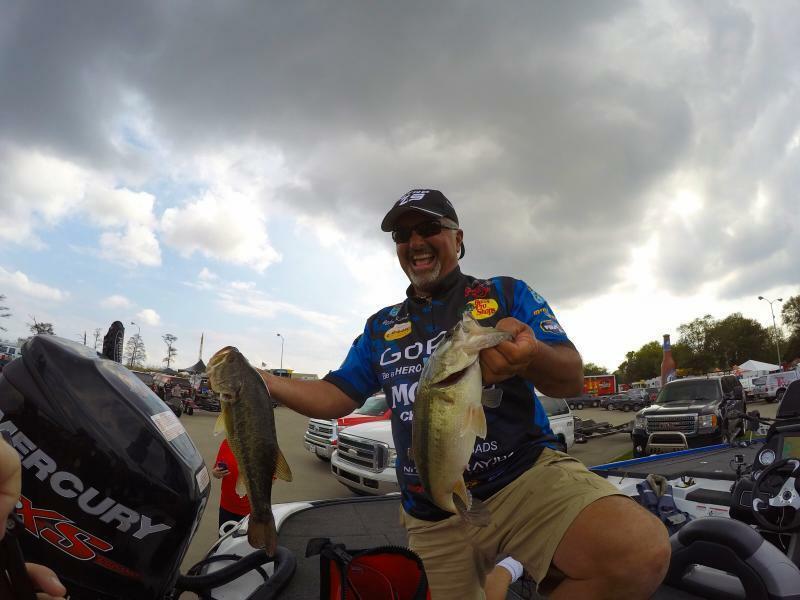 That could be the biggest fish of the entire tourney! "Things turn out best for those who make the best of the way things turn out" - Zachary Troy Schrah - a young man with vision far beyond his years. He's in great position after day one a limit tomorrow will go a long way. Good luck Mike, Go get em! Last edited by JMac-D; 03/20/15 01:24 AM. Thanks guys. Appreciate you all keeping up with me and the tournament! Good luck, Mike! You were on the right size fish today. Good luck bud! We are all pulling for you! Go get em tomorrow Mike! Great job Mike go get them again tomorrow!!! We heard early on about your struggles for the start of the day. Power through tomorrow and show em what you got bud. We will be rooting for you! Good luck Mike. That Sabine can be tough fishing. Go get em. 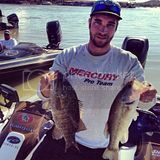 Very unfortunate I can't believe they even go to a body of water where it's questionable about what's private and what's not and for another Elite Angler to protest him when he fished there the day before it was marked Is unbelievable. I'm proud of the way he fished this tournament and look for many great days to come. Sorry to hear that Mike..A little dicey on the DQ, especially if you honorably called it in before the familiar fisherman..You did all you could...Great job either way. 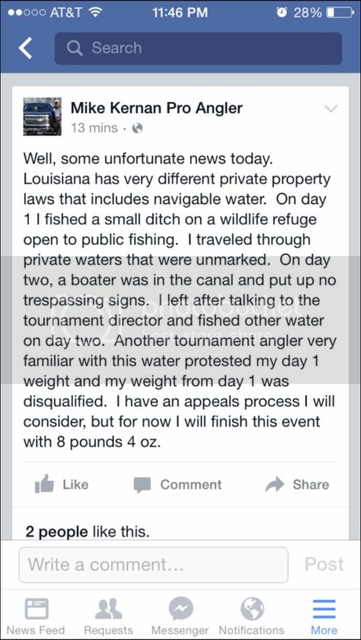 Very unfortunate I can't believe they even go to a body of water where it's questionable about what's private and what's not and for another Elite Angler to protest him when he fished there the day before it was marked Is unbelievable. That's the Louisiana way , happens everytime they go there it seems like. I hate it for mike but it is what it is. Reminds me of how boater angler friendly our water way laws are. Actually it was 54th place and he is supposedly a "local" and I am guessing he kept that trump card in his pocket from day 1 until it benefitted him to make a check. I guess you can or cannot file protests in BASS if and when they will benefit you personally. Not to try and maintain overall integrity of the field. Hey guys, let's stay on the high road on this one until all appeals are complete. It is in my best interest and BASS best interest to stay level headed on this. I really appreciate the support. But let's not turn this into something crazy. When life throws us challenges, thinking through them meticulously is the best solution. Please give me that chance. I respect those involved from BASS. They are objective and professional, and as anglers we really need that. The appeals process will only take about a week.